Quiet music tinkles on a grand piano as we step inside the restaurant. The squeak of the door, ornate, hanging chandeliers, and double-sided fireplace convey a sense of coziness and old-fashioned slowdown. We approach the counter, (wait? No sit-down service? what’s this!) stand in line and order “a sausage egg and cheese biscuit, two cups of oatmeal, a medium orange and coffee, please.” We could just as easily have been purchasing one of those iconic sandwiches that essentially ushered in the fast-food era. That’s right, welcome to one of the most unusual McDonald’s in the US. Fancy, but yeah the food is still the same. The acoustics are such though that we easily converse while injecting initial fuel, and deciding that seconds might not be a bad idea considering all of the walking we will be doing later. Satiated, we exit and traverse the few blocks between this location and the vastly fancier Biltmore Estate, a huge property owned at first by the Vanderbilt family on which George, a sibling living in the late 19th and early 20th centuries, constructed a castle that rivals those in Europe. Arriving at the ticket pickup desk at 12:30, we first encounter what threatens to be a big snafu. Oh good grief, I think to myself, could I have made a mistake of that magnitude with so much money on the line? The strange thing is the audio device I have reserved is indeed set to be had on Saturday the 16th. They do work us in anyway at 1:30, and when I check my email in the car I verify that the mistake was not mine! Thank goodness. Even when we get out of the car at a space, we still have to walk about 8 minutes much of it uphill to reach the actual house. It is hot, quiet, and smells like it probably did in those early days. Audio devices acquired, which were like telephones that you hold to your ear, we enter the spacious residence. Each exhibit has a number, and if one wishes to hear the descriptions and background information about said you just enter the number into the keypad. I had only purchased one, but am happy they have also gone ahead and given her one as well. I can’t speak what they’re saying quickly enough! And as I discover in the Billiards room, the acoustics are such that one must be careful how they speak. “I THINK I HAVE PUT IN THE WRONG NUMBER!” I say when they start talking about an Italian-themed room instead. (Well I hope I’m not speaking that loudly, but it at least sounds so, prompting her to let me know this and causing me to feel a bit silly and not speak for the next three exhibits. The thing is, I feel as if the room is empty when in actuality it is full. So I can claim environmental unawareness while also accepting that I don’t exactly differentiate between “Indoor” and “Outdoor” voice as well as I should. But, I do manage to recover a bit. This initial room is impressive, as well as the library (10,000 of Vanderbilt’s books still exist,) a sitting room where people wait for dinner, another where dinner is actually consumed, and I think a different entertainment hall. Yes, they had too much money. Finally, on the first floor we exit to the loggia, ah c’mon the back porch! It is a nice area, with I assume fairly nice views as well. Then inside and up the “Grand Staircase.” I think the second floor contain the Vanderbilts’ rooms, and yes they had separate ones due to the idea that he shouldn’t see her being dressed by servants. They would often meet in yet another sitting room between the two. On the third floor, the guest level, there was ALSO a sitting room where they could gather to chat, because how much else was there to do in those days? A shortcut allows for quick access to the library, so that guests could find a title of their liking to take to bed and read. Of course pretty much nothing can be touched, due to its fragile nature. Yet as a blind person, I still feel I got a lot out of it because of the in-depth descriptions given by curators and others affiliated with the estate in some way. I wonder if other museums have audio tours in this way. And, I can still feel the immensity of the space as well. The only other thing of interest is the basement. Here, we enter the bowling alley, probably one of the first of its kind in a private residence; the pool room, where that pool was fed with water from a mountain reservoir and had to be drained after use because of course this was prior to chlorination; and the innovative laundry room, wherein clothes could be dried by placing them onto racks and sliding them into a cabinet where electric coils raised the temperatures. The Vanderbilts had much of the latest technology, including Edison lightbulbs and a more efficient kitchen for the servants to use. They note that one could learn more about the servant’s life there by getting a behind-the-scenes tour, but I would also recommend the book I am now about to finish called Maid to Match, by Deeanne Gist. As mentioned in a previous entry, much of it takes place at Biltmore, and it is a really intriguing story about a young woman who falls in love with the “useful man,” thus putting her chance of being Mrs. (Edith) Vanderbilt’s Lady’s Maid in jeopardy. It really helped me to understand a lot about how things were when I went in there, too. Finally, we get stuck out front for a good while as those rains continue to pound. Luckily, they have sheltered benches where she meets and converses with a dogowner who has a stroller for her pets, and who has also a crown from winning some kind of Ms. East Texas. Another individual recognizes us from the trolley tour. We make a perfunctory visit to some of the shops they have outside, including a chocolate place where I contemplate getting something but am not sure if I would like it. The café is also full, so we make our way through the last drops toward the shuttle to head back over to the parking lot. And that about covers the interesting part of our little vacation into the hills and Asheville. I thoroughly enjoyed it, and look forward to whatever else life has in store, as well as to new and unexpected memories. 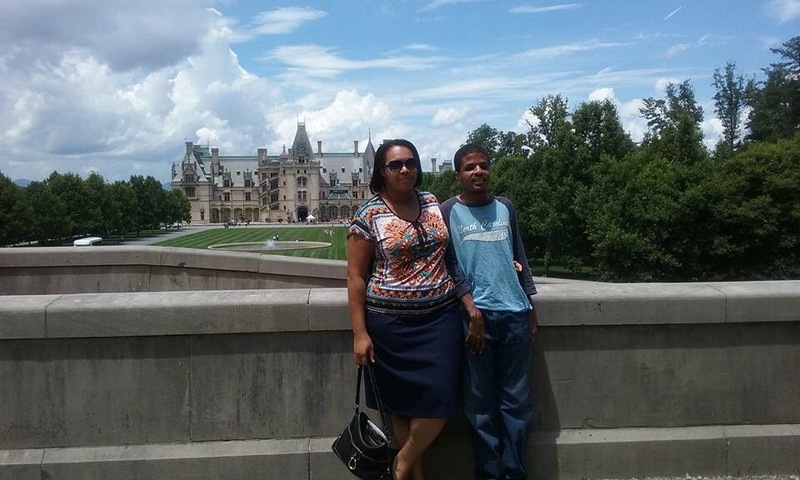 Thanks for the great description of the Biltmore Estate – a place and a part of the country I’ve never visited. Reading the books connected to your vacation destination must make the place come alive even more. We hope you are able to get over here someday! I’m not as sure about the mountains, though, as that elevation played havoc with my aids. It was a neat experience, however, and I’m always glad when I can render it into words. Yes, as a blind person, I’ve just never had this kind of access to books. A good author can definitely enhance my experience, even and perhaps especially in fiction. So glad you got to experience the Biltmore. Your experience would be so different than mine and it was very cool to read that you could “feel” the immenseness of the place. It is pretty amazing. I love the pic of you and your girlfriend in front . We took a similar picture on the lawn with our grown children last Thanksgiving and got all the extra people photoshopped out so it looks as if we are all alone in front of the mansion. Thanks for the great tour. That pic sounds cool. I’ve heard it’s especially nice to go up there during the holidays, though I’m not a fan of the cold weather that would certainly be there then. Thanks for reading my mosts.